as required by Chap. 21, Session Laws, 1905. 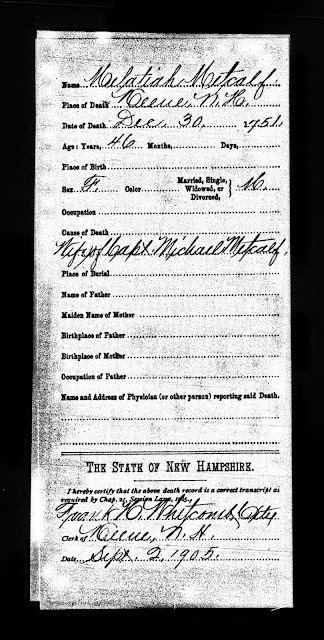 * Clerk of: Keene, N.H.
"New Hampshire Death Records, 1654-1947," digital image, FamilySearch International (http://FamilySearch.org), 2010, “Death certificates, 1901-1937", Melatiah Metcalf entry, 1751; citing New Hampshire Bureau of Vital Records and Health Statistics. This document is a Derivative Source - the Original Source is a Keene, New Hampshire town record which is not yet available online. This is Primary Information, since it was derived from an Original Source. It is Direct Evidence since it provides a name, a relationship to the spouse, and the date and place of death explicitly. Melatiah Hamant was born on 26 May 1704 in Medfield, Massachusetts, the daughter of Timothy and Melatiah (Clark) Hamant. She married Michael Metcalf (1706-1771) in 1726, and they had eight children between 1729 and 1745. Michael and Melatiah (Hamant) Metcalf are my 6th great-grandparents, through their son Burgess Metcalf (1741-1816) who married Jerusha --?-- (1750-1817) in about 1770.